Rapunzel and Flynn are tangled up in love in this vivid and colorful image by Disney and Thomas Kinkade Studios. This officially licensed StarFire Prints Hanging Glass Decoration is perfect to hang in windows or where natural light can illuminate all the wonderful colors. StarFire Prints Hanging Glass Decoration StarFire Prints Hanging Glass Decorations are vivid, high-quality prints on sparkling, semi-translucent glass. These images are permanently fused into the glass, resulting in a semi-translucent print that captures the natural light, enhancing the color display and making each image a true piece of art. ✅ DAZZLING DISPLAY – Light-Catching glass allows natural light to illuminate your image. Looks great in windows! 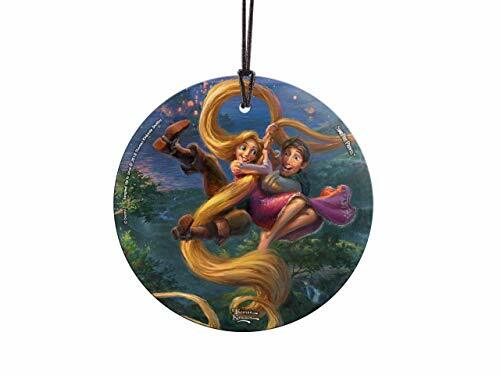 ✅ PERSONALIZED – GREAT FOR GIFTING AND COLLECTING – Comes with hanging string for instant, easy display. ✅ MADE IN THE USA – Designed, printed, and shipped by Trend Setters Ltd.